The company claims that the Picooc Mini is the first smart weighing scale in India that shows 13 unique body measurements with professional grade accuracy. Picooc has launched a new smart health scale in India. The company claims that the Picooc Mini is the first smart weighing scale in India that shows 13 unique body measurements with professional grade accuracy. The scale also has the Bioelectrical Impedance Analysis (BIA) technology with a metal-less ITO layer that enhances the sensitivity, enabling to track the tiniest changes that occurs in the user’s body. 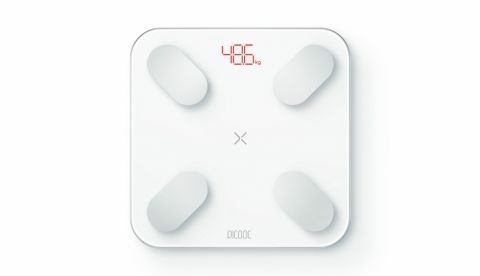 Picooc has launched Picooc Mini, a high-precision health monitoring smart weighing scale in India which will be distributed exclusively by Optiemus Infracom Limited (BSE: 530135, NSE: OPTIEMUS). Staying true to its name, Picooc Mini is a compact device, making it easy to store and carry and can also be connected to the user’s smartphone using a Bluetooth connection and processes the measurement data to create health trends. It also offers personalised suggestions on the Picooc Mobile App. The device allows to create unlimited profiles, hence, making it ideal for family use as well. Priced at Rs.2,999/-, Picooc Mini will be available exclusively on Flipkart from 5th February, 2019. Using Picooc Mini, users can measure their weight along with 12 additional body vitals including BMI, Body Fat, Muscle Mass, Protein, Bone Mass, Metabolic Age, Visceral Fat Index, BMR, Body Water, Body Type, Skeletal Mass & body girth. In addition to this, it also offers a unique body score that is calculated using the body vitals. The device is provides all this information in the shortest span of just three second, therefore providing the user a holistic view of their health in no time. The device provides professional grade data accuracy using the BIA technology with a metal-less ITO layer that enhances the sensitivity, therefore enabling to track the tiniest changes that occurs in the user’s body. Combining high-precision data recording & big data core algorithm, the device is designed to offer one of the most accurate comprehensive health measurement report making it ideal for health-conscious people who want to keep track of their fitness from the comfort of their home. Picooc Mobile App is available for both Android and iPhone devices. The application shows data that can help the users to set goals towards their desired fitness plan. The app also provides personalized suggestions using the big data core algorithm technology and shares the user’s body score with their friends and family to encourage them in attaining their fitness goals.